Vision Spatial Relations is the ability to perceive relationships of objects position in space. 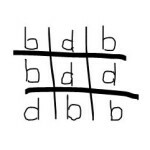 Children who reverse letters are often lacking in this important perceptual skill. Two important considerations in spatial relationships are laterality and directionality. Laterality is the ability to know right from left on oneself. For example, because of laterality, you know which one of your hands to place over your heart when you recite the Pledge of Allegiance. Directionality is the ability to see right and left on other objects. 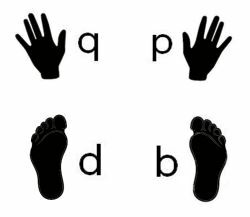 With directionality, you would be able to detect how words appear left to right on a page of text or know the difference between a b and d.
Say the direction of the arrow: up, down, left, right. Bring it Home: Once this becomes easy, repeat the process to the beat of a metronome, available online or through a smart phone app. 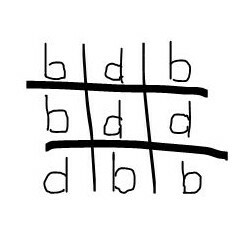 LETTER TIC-TAC-TOE with b and d, p and q. Playing this simple child’s game using similar letter pairs will help develop spatial relations and improve letter reversals. If the child makes a mistake and writes the letter backwards, the square goes to his partner. VARIATION: Use right and left arrows to help directionality. This activity helps integrate laterality with directionality, i.e., left-right body awareness with left-rightness of other objects. It’s a great activity for common letter reversals. Sit at the computer with hands on the table and both feet on the floor.
. 5. As you read the letters aloud, tap the appropriate body part at the same time. Hokey Pokey and Simon Says: Play these simple children’s games emphasizing left-right body parts.